Glad to be a Girl: Can Anyone Else Smell Peanuts? Can Anyone Else Smell Peanuts? It's a good morning today. I'm feeling better about things and enjoying my single-ness well, for now at least. Yesterday evening I went to see Miss Potter, alone. Beatrix Potter has delighted generations of children with her books. But she kept her own private life locked carefully away. 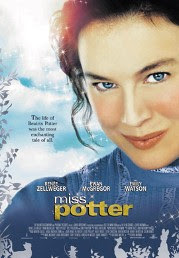 Oscar-winning star Renée Zellweger is now bringing her secret story to the screen in Miss Potter, the first film directed by Chris Noonan since his charming 1995 movie, Babe. It is set in the high summer days of late Victorian and Edwardian England, during which Beatrix develops her natural skills as artist and story-teller. When she finally publishes her debut book, The Tale of Peter Rabbit, she becomes a writing celebrity. It also leads to courtship and her first love with publisher Norman Warne, played by Ewan McGregor. Their relationship and his marriage proposal in July, 1905, was to change Beatrix's life for ever. I grew up having Beatrix Potter stories read to me by Marga, my grandmother. In fact I think she owned the entire collection! Along with Enid Blyton, she was certainly a staple of our childhood. And, I loved the movie ... although Renee Zellweger does spend far too much of the movie with her face scrunched up in that way that only she can. So, aside from enjoying my single-status for an evening at the movies, I've now got an entire long weekend to contend with. And, don't get me wrong, I love public holidays as much as anyone ... in fact I'm all in favour of the current Holy Holidays for All debate. But when you're newly single, I fear this may just be more alone time that I can quite deal with right now. At least Mom is flying up for the next one at the end of April :) Yay. Oh and in a total aside, what sort of illness would the smell of peanuts indicate ... or rather, if not a human ailment, how about some sort of impending car engine disaster? It may sound peculiar, in fact I'm sure it will, but I noticed it twice while driving last night. And I know that I have an acute and often creative sense of smell, but it was very strange. There I was, happily driving along and suddenly the car is filled with the smell of peanuts. And I can't quite tell if they were those yummy chocolate covered ones, which I originally thought, or those salted ones with the red skins my grandfather used to love. Odd. I love your blog template, by the way. Hmmm, I must've blocked the rabbit pie from my memory ... to be truthful, I don't remember much of the stories at all, just sitting in my grandparent's lounge listening to them :) Ahh, childhood! @Urk - I think you must have hit the nail on the head ;) That would explain all!